If you’ve been golfing for any significant amount of time, you know that a reverse swing angle fault can cause more harm than just a slice. Faults like these can lead to serious golf-related injuries—in this case, probably lower back pain—and injuries will do nothing but hinder your game further. Over 50% of amateur golfers will experience an injury related to their sport. At this skill level, almost all injuries come from a lack of professional wisdom, resulting in poor technique or poor conditioning. As with any sport, it’s important to find someone who can guide you through the postures that are best not only for your swing, but for your physical health, too. Unfortunately, such an expert is not always readily available when you’re itching to hit the course, and while you may have taken the time to educate yourself with swing drills and setup tips, it’s easy to slip back into old habits when there’s no one there holding you accountable. Ignoring the pain and hoping that you can protect it by favoring another posture will only lead to the end of your golf game, sooner or later. Many athletes may also try to resolve their injuries by taking a dose of an anti-inflammatory before they play. While this might help to temporarily alleviate the pain, to be dependent on these painkillers is not wise as recent studies have shown that continual use of these pills may lead to heart attack, stroke or brain damage. So what’s a golfer to do? Good news: electrotherapy such as TENS (transcutaneous electrical nerve stimulation) has recently become more accessible to athletes everywhere and serves as a safe, addiction-free, drug-free relief to pain, long and short term. 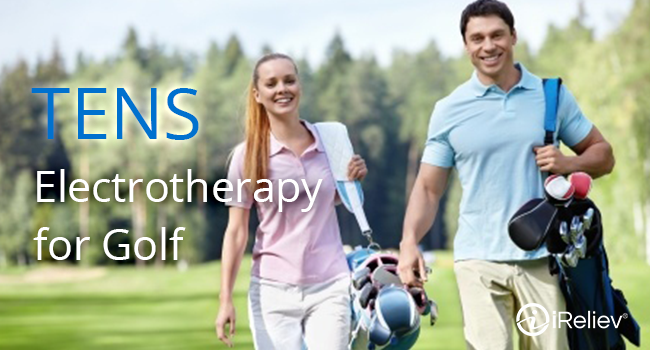 TENS electrotherapy for golf injuries works by sending gentle pulses of electricity through the skin and to the nerves where the pain is, effectively deflecting the pain signals away from the brain. Electrotherapy has become increasingly popular with professionals such as physical therapists and chiropractors, and now TENS machines are being manufactured in styles that allow patients to take it with them—whether they go home or head to the green. These newer TENS machines are now small enough that they can be worn while you participate in your daily activities, including golfing. While the electrotherapy does its work, you can play a pain-free game, making it easier for you to correct the poor posture or techniques that gave you an injury in the first place, all without having to depend on unhealthy painkillers. 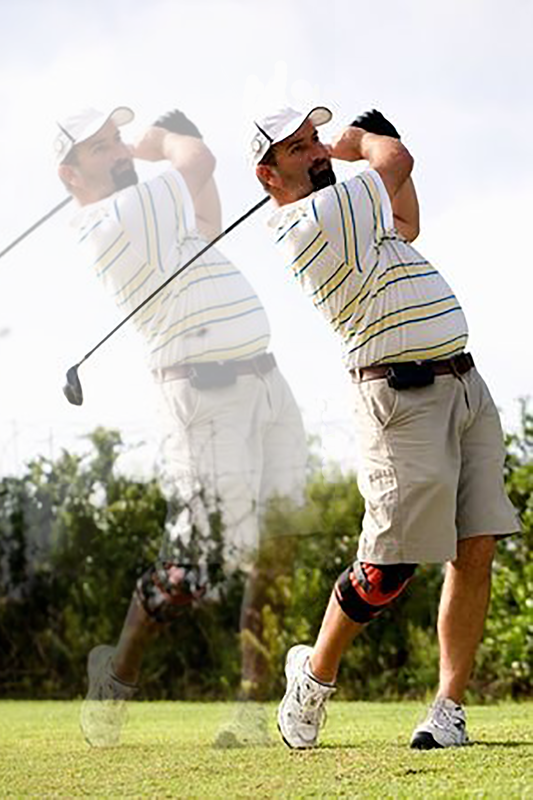 For instance, a golfer might choose to target the electrotherapy around his or her lead knee, and when the pain is no longer there, proper stance and rotation can be put into effect, which in turn strengthens the knee and protects it from further injury. In another example, a golfer puts the electrotherapy on his or her lower back. What can often be crippling pain is now relieved, and the golfer can again strengthen the injured area, and turn that C-shape into a tall, stable and confident stance. For a long term solution that will improve both your golfing technique and your physical health, electrotherapy is worth considering.